Bob (Carlosdetweiller), I remember you posted somewhere a promo item of Silver Bullet that was really cool! can you post the picture here? I plan on being at Blockbuster as soon as I can on the 25th. I'd like one of those globes. Misery promo paper and The Green Mile bookmarker. The 25th? As in March 25th? Like, today? I had to go to two stores--each store got three, but all three arrived broken at the first store I went to. The second store had all three. Sir Boomme said the Blockbuster in his area got six. 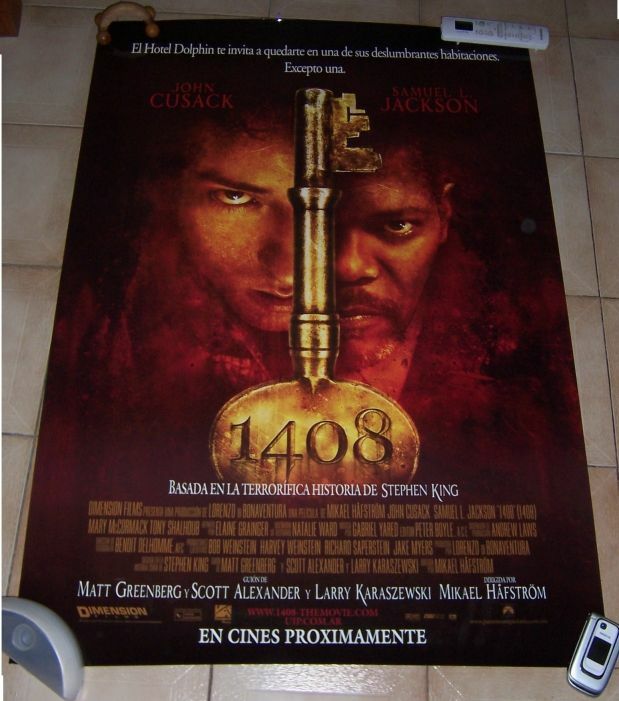 You have to buy the movie to get the globe. I bought the movie, but then discovered that I bought the single-disc version. I'm going back tomorrow to see if I can swap it out for the two-disc edition. Thanks again, John. If only I can corral my kids into the car (it's their spring break)... It's like herding cats these days. Ah, but you have motivation. You'll find a way. The Blockbuster I was at only had the single-disc edition, and that's all they carried. He said it would be the same for the other stores in the area as they all buy the same stuff. I'm not sure I believe him, but I bought it anyway. There were four globes at my location, and mine was fine. I'll let you all know tomorrow if I was successful in getting a two-disc version. My Blockbuster received 4 globes, but only the single disc versions. For once, the time delay of being on the West Coast actually helped. Just after 10am, I was only the second customer and the first to buy The Mist. They only had the single disc version - based on comments in this thread, I'm thinking the two-disc set has not yet been released. Our local store had 4 globes. 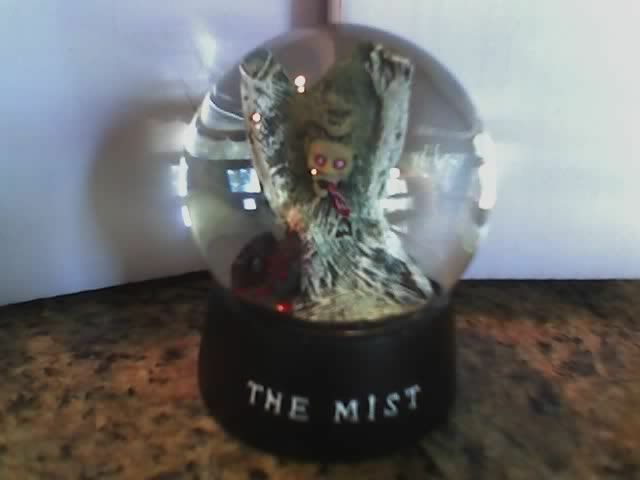 I bought 3 movies, each with a snowglobe. So are the non-U.S. collectors here getting any of these globes anywhere? Brice, you're a collector of all things King promo. Did you pick one up today? I'll be going to work this afternoon, so I'll be in a different town in a couple hours. 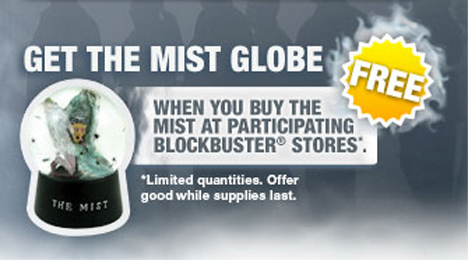 I can stop by that city's Blockbuster to see if they have any globes, if anyone who doesn't have access already is interested. well... i got one movie/1 globe... though they had all six still. BTW....my opinion... the globes are a bit cheesy. not really worth the 23.00 movie price unless you were going to buy the movie anyways. I wish they could have put a few more spiders that float around inside, too. Yeah, Patrick I got one. My local Blockbuster had four and still had them all when I got there about 1PM. Ahhhhh the funny thing about collecting is that everyone's tastes run differently. I read through this thread and say to myself "they paid good money for THAT?" Promo items generally just don't float my boat, but for you all that just means is one less competitor. Glad you all are excited about your items. THAT FEELING I can relate to! Make that two less competitors out there! 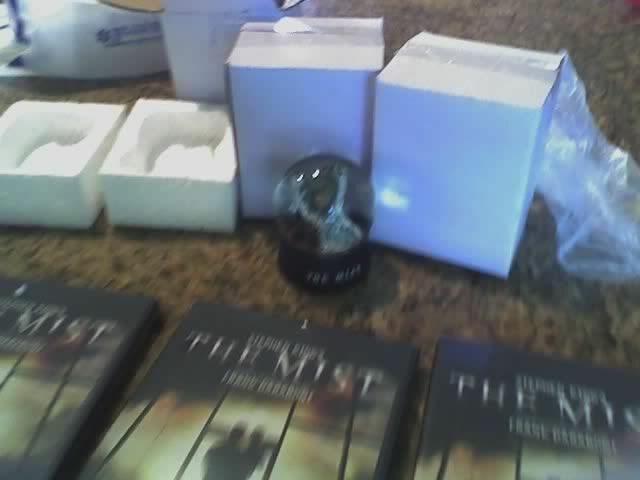 While promtional items do indeed float my boat, I am only interested in US BOOK promotional items. I too can relate to feeling excited about a new purchase, so congrats and enjoy!